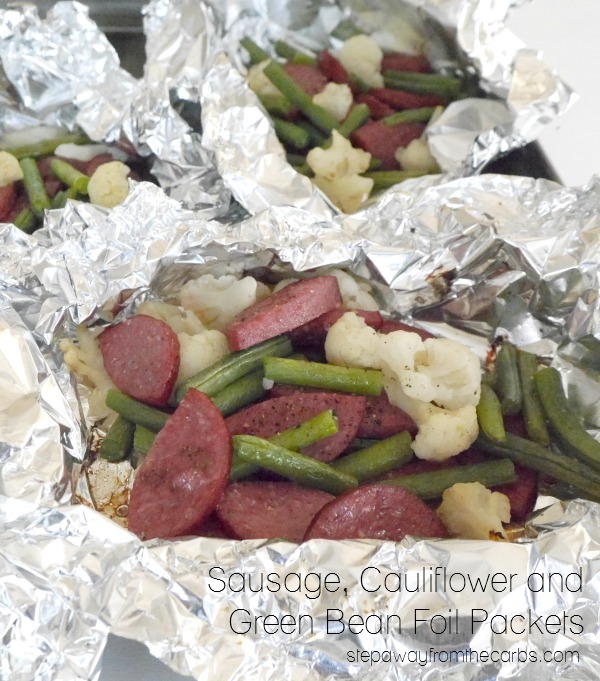 Enjoy fantastic flavors with these easy low carb foil packets that include beef summer sausage, cauliflower, and green beans! Did you see my recipe for a One Pan Sausage and Shrimp tray bake that I posted a few months ago? 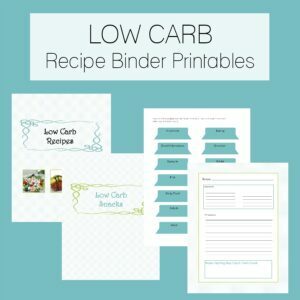 I am *completely* converted to sheet pan meals now and cook them all the time! 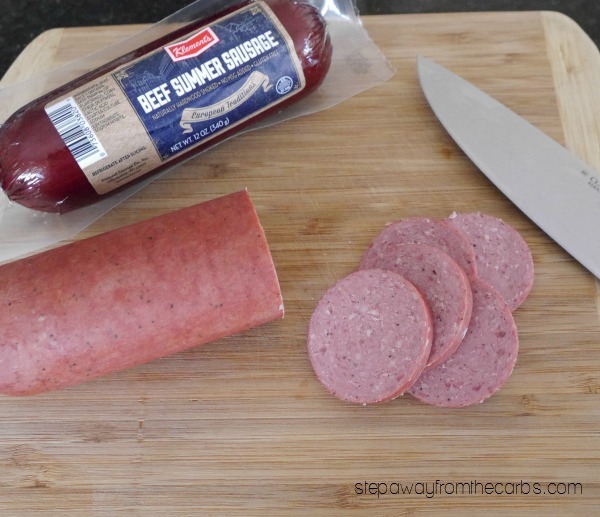 Today I have another recipe using a different sausage product from Klement’s – Beef Summer Sausage! The range of premium meat products from this 60 year old company includes summer sausages, snack sticks, fresh sausages, cocktail smokies, ring bologna and more, and I just love how these handcrafted artisan products also happen to be low carb! 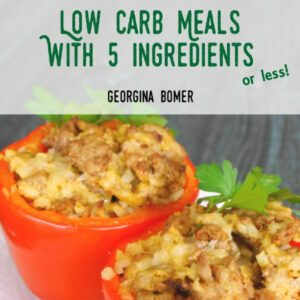 Like my one pan meal this is SO easy to prepare and cook. And the great thing about using the Beef Summer Sausage (other than the flavors that it imparts!) is that it is ideal for a one pan dish as it is pre-cooked. You could also try one of the other varieties: Original, Garlic, Cheddar or Jalapeno! To prepare the meal, slice the summer sausage and then cut each slice in half. Lightly spray four pieces of kitchen foil with olive oil spray, then divide the sausage between them. Add trimmed green beans and small cauliflower florets. I actually par-cooked the cauliflower in the microwave in a little water, then drained them and added them to the foil. Season with salt and black pepper, then close up the foil packets. There really is no need to add any extra seasoning or spices because the flavor of the sausage will enhance everything else! Place on a baking sheet and bake for 25-30 minutes until the vegetables are cooked to your liking. Either serve in the foil packets or transfer to plates. 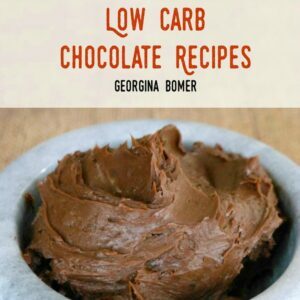 And this recipe would also work REALLY well if you cook it on the grill! 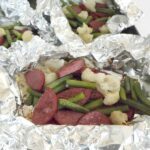 Lightly spray four pieces of kitchen foil with olive oil spray, then divide the sausage, green beans and cauliflower florets between them. Season with salt and black pepper, then close up the foil packets. Place on a baking sheet and bake for 25-30 minutes until the vegetables are cooked to your liking. Thanks Nico – I’ve now added a per serving breakdown for the nutritional data. 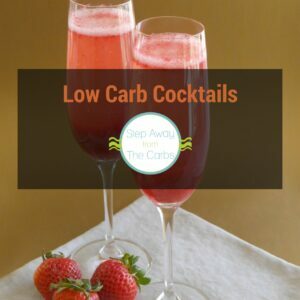 I try to look for sausages with a very low net carb count!